This unrivaled tropical hideaway offers Unlimited-Luxury.® Designed for the most discriminating travelers, this dream world offers 232 luxurious suites, magnificent views of the Pacific Ocean and the Sierra Madre mountains. It offers an array of leisure and recreational opportunities and gourmet dining. Nearby attractions include seasonal whale watching, year-round world famous fishing, championship golf courses and exciting shopping and nightlife. Located on Banderas Bay in Nuevo Vallarta, Mexico. 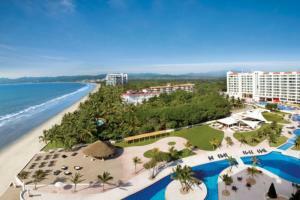 Only 15 minutes north of Puerto Vallarta's International Airport.